Providing supply chain planning software and methodology, Barloworld Supply Chain Software offers solutions to maximise the efficiency of the supply chain. Barloworld SCS supply chain consultants work with clients to ensure that there are robust supply chain management processes in place. Its supply chain network modelling software, CAST, designs and configures optimal supply chain infrastructure, while Optimiza demand planning and inventory management software delivers the optimal inventory deployment strategy. Both supply chain planning software solutions offer depth in functionality backed up by robust implementation and a proven track record in delivering strong returns on investment. Supply chain modelling and network optimisation trades-off competing costs, such as warehousing & transportation, to identify the optimal supply chain configuration. This takes into consideration target service lead times for forecast, or actual, supply & demand volumes by location. By optimising the supply chain in weekly, monthly and yearly time horizons, CAST can identify not only what the optimal supply chain should be, but also when changes to the network should occur, thereby optimising the network migration and implementation plan, and realising all the potential savings identified in the strategic review. From holiday peaks in consumer markets, to harvest periods in agriculture, seasonal variability in supply and demand puts strain on the supply chain, resulting in higher operating costs and reduced profit margins. Barloworld SCS clients have been using CAST Aurora supply chain network modelling software to evaluate the cost and service impacts of alternative global manufacturing footprints, moving operations from high cost countries in the West to low cost manufacturing bases in Asia, Latin America and Eastern Europe. Retailers are also using CAST Aurora supply chain modelling software to design supply chains for overseas market expansion, expanding home delivery and internet shopping networks and to evaluate alternative and collaborative sourcing strategies. Agile, flexible and efficient supply chains need to be planned. So we offer the tools, processes, people and experience in inventory optimisation to inspire your people and your company to reach new heights. 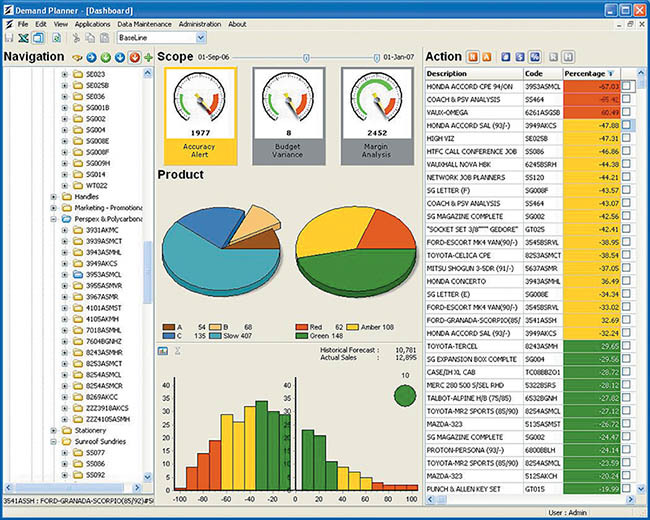 Highly regarded as a world-class inventory optimisation tool, Optimiza inventory management software enables companies to build an inventory model that simulates the unique characteristics of their business. Optimiza provides an easy-to-use interface and is adaptable, quick to implement and process-based. Unlike ERP and other inventory management software systems, Optimiza is designed as an inventory management tool and is not a transaction-based system. More than 600 companies and 4,000 people involved in supply chain planning across Europe, the USA, Asia Pacific, Australia and Africa have, in partnership with Barloworld Supply Chain Software, gained better control of their supply chains and created opportunities to model the future of their companies. We would be delighted to share some of our individual experiences with you. Please contact us for our case studies and testimonials. Simple item level forecasting can satisfy many businesses, but with ever-increasing complexity being introduced by shorter product life cycles, expanding regional and global customer bases and an explosion of new product variations and alternative brands, advanced demand management becomes a necessity. In addition, the way we do business is also changing. Manufacturers, distributors, wholesalers and retailers need to constantly collaborate with their suppliers to ensure that they are constantly in synchronization with demand variations caused by promotional plans and new product introductions. Optimiza Demand Planner uses multi-level forecasting techniques that dynamically calculate seasonality and trends, intelligently selecting the right algorithm for each product level and aggregating or disaggregating the results up or down the product, geographical and / or channel hierarchy. Optimiza Demand Planner allows the user to incorporate causal factors such as 'Hours of Sunlight' or 'mm of rain' when generating the forecasting. Optimiza Demand Planner has a highly effective forecast accuracy and alerts function that ensures that focus is directed to the areas that will make the biggest difference to the business. Logistics can manage and view the forecast by inventory type.